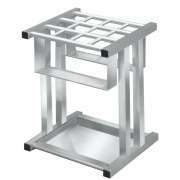 Umbrella stands are a must for any office in a location where it frequently rains outside. Don&apos;t let dripping umbrellas create pools of water in your lobby. A few well placed umbrella holders will keep your office looking professional, even when the weather outside gets wet. Where can you get an umbrella holder? At Hertz Furniture, you can choose from a variety of different models. Umbrella stands should be both functional and stylish. A good design is one that is inconspicuous yet easy to find when needed. Hertz Furniture&apos;s great selection ensures that your visitors will have the perfect place to put their umbrellas. 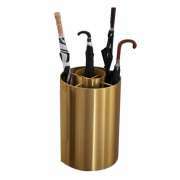 What style umbrella stand should I get? Glaro umbrella stands feature a sleek modern design that is subtle yet attractive. Their tall cylindrical shape enables them to fit in small, out-of-the-way spaces such as corners. They feature closed bottoms which catch water as it rolls off of umbrellas, rather than allowing it to pool on the floor. These sleek models are available with both an open interior, and divided into compartments. Open indoor umbrella holders offer distinct advantages. When wet or damp umbrellas are allowed to air out, the water on them evaporates quickly. This process will often leave the umbrella completely dry by the time your client or colleague is ready to go outside again. If its isn&apos;t raining anymore, the dry umbrella can be put away without getting anything else wet. If you like indoor umbrella stands with open sides, we have models with different capacities and finishes, so you can have the style you want in a size that fits your needs and space. You can choose either a 12- or 24-umbrella model with either a satin aluminum or a satin brass finish. It&apos;s easy to get possessions mixed up with so many people coming in and out of your office, especially when most people have similar compact black umbrellas. Separate spaces in an umbrella stand keep individual umbrellas secured in the upright position so your visitors can easily identify their possessions based on placement. How do I keep the floor under my indoor umbrella stand dry? 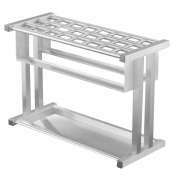 Our open umbrella holder stands have other convenient features that make them appropriate for a professional setting. A pan at the bottom of the metal umbrella stand catches water that slides off, so you don&apos;t have to worry about puddles. At the end of the day, it&apos;s easy to empty out the water so your umbrella holder will look as good as new in the morning when clients start to come in again. 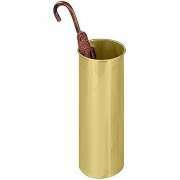 Rust-proof umbrella stands will not be affected by moisture, so they are appropriate for both indoor and outdoor use. 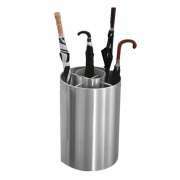 What can I do with my umbrella stand when it&apos;s not raining? One great thing about Glaro umbrella holders without separate sections inside is that they can be used for other purposes as well. Because the inside is open, you can easily put a bag in and use it as a sleek garbage can. This way, rather than taking up space in your storage closet when not in use, your umbrella holder can be used for a constructive purpose year round. If you have a small office, or simply prefer not to have a separate umbrella holder, we offer a two-in-one option. The Safco costumer has a built-in umbrella stand at the bottom. 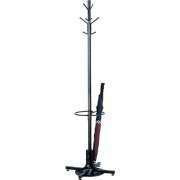 If you just keep this coat rack in your lobby or waiting room all year round, you won&apos;t have to worry about bringing out a separate umbrella holder when it&apos;s raining outside. Where should I put the umbrella holder? If you are buying an umbrella holder for an office, the best place to put it is near the entrance to the lobby or waiting room. 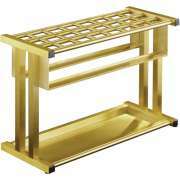 Of course you don&apos;t want it to be the first thing people see when they walk in, even if you have a sleek modern umbrella stand. Ideally, you will find a space that is near the entrance yet slightly off to the side, so people can easily find it but don&apos;t focus on it too much when they come in. Having a place to put umbrellas isn&apos;t only important in a professional setting. When students come into school on a rainy day they also need a place for their umbrellas. If they are put in a locker, they will not only stay wet, they will get everything else wet as well. However, unlike in an office, if you have an umbrella stand near the entrance to a school, it can easily take over the whole area and cause things to get lost. The best idea is to think about where to put an umbrella holder when determining classroom layout. Having an umbrella stand at the entrance to your company or institution&apos;s offices demonstrates that you care about patrons, employees and clients. Hertz Furniture&apos;s sleek umbrella holders have the classy appeal you need in a professional space. Many even come with our complimentary extended warranty for years of worry-free use. If you need help choosing an umbrella stand or deciding where to put it, contact the experts in the Hertz Design Center for free project-planning advice.